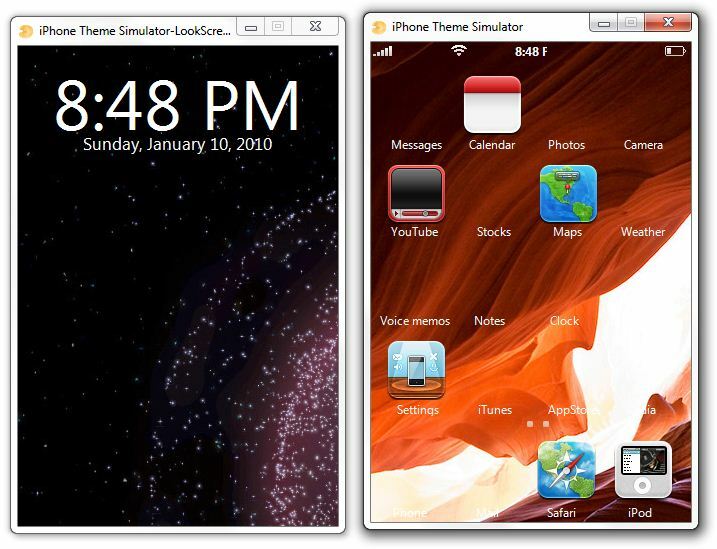 iPhone Theme Simulator is a neat little tool which enables you to test and design your themes for Winterboard app right on Windows PC or Mac without having to load it up each time on the iPhone just to test it. For those of you who don’t know, Winterboard is a free app available in Cydia which enables you to customize the appearance of your jailbroken iPhone in almost anyway you like. click here to see the image in high-resolution. With iPhone Theme Simulator, you can customize the springboard, lockscreen, Status bar, WiFi and battery logos, background, time and date styling, icons for apps and the dotted scroll buttons at the bottom. The app is currently available for Windows only, but I have been told that a Mac version of the app is currently in final testing stages, and could be out by the end of this week or even earlier. Here is a video, showing the app in action under Windows 7. You can follow me on twitter or join our facebook fanpage to keep yourself updated on all the latest iPhone apps releases. Anybody know the name of the theme in the screenshots from above?